Papayas can grow to be as large as 20 inches. Unripe papaya has a high concentration of the enzyme papain, which assists in protein digestion and is used in many beauty products. The peppery seeds can be eaten fresh or can be dried for their anti-parasitic properties. 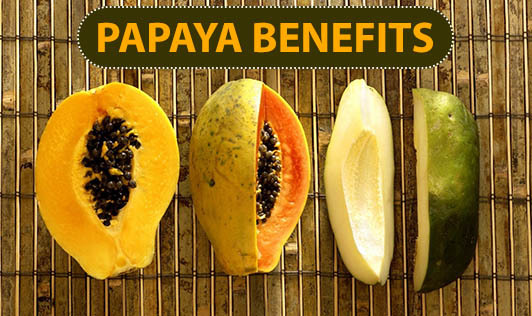 Eat a spoonful of papaya seeds once a day on an empty stomach while traveling to prevent parasites. To remove parasites, eat for one week, then wait a week, then repeat. Blend into smoothies or chew well. Soothes the digestive tract and eases indigestion. Helps reduce flatulence. Reduces the risk of heart attacks and atherosclerosis. Prevents oxidation of cholesterol, preventing cholesterol from building up on blood vessel walls. Repairs hardened or damaged livers. Extremely cleansing internally, and therefore helps clear up skin ailments. Rubbing partially ripe papayas on the skin softens and dissolves dead skin, repairs skin damage and wrinkles, lightens freckles, and clears the complexion. Avoid the eyes.